Mechanicsburg’s Francys King delivers a pitch against West Liberty-Salem on Monday. King shut the Tigers out over five innings, allowing just one hit. WEST LIBERTY – Mechanicsburg defeated West Liberty-Salem, 12-0, in five innings of OHC softball on Monday. The Indians hit Tigers’ starter Kelsey Day early and often, putting four runs up in the first inning and another six in the third. For Mechanicsburg, Daytayviah Rodgers was 3-for-3 with a double and 2 RBI, Taylor Hurst was 2-for-3 with a double and 2 RBI, Audrey Ayars was 2-for-4 with a triple, Megan Alspaugh was 2-for-3 with two doubles, Hanna DeLong was 2-for-4 with a double and 2 RBI, Macy Reed was 2-for-4 with an RBI and Morgan Heizer doubled and knocked in two runs. For WL-S, Day got the only hit, going 1-for-2. Francys King pitched all five innings for Mechanicsburg, striking out 10 batters against one hit and one walk. Today, the Indians (2-1, 2-0) host Triad while West Liberty-Salem (2-3, 0-2) hosts Northeastern. NORTH LEWISBURG – Triad defeated West Jefferson, 4-0, in OHC softball on Monday. For Triad, Kendell Hughes was 2-for-3, Kristin Bailey had a triple and 3 RBI and Holly Alvoid was 2-for-4. Triad (2-0, 2-0) goes on the road to Mechanicsburg today. 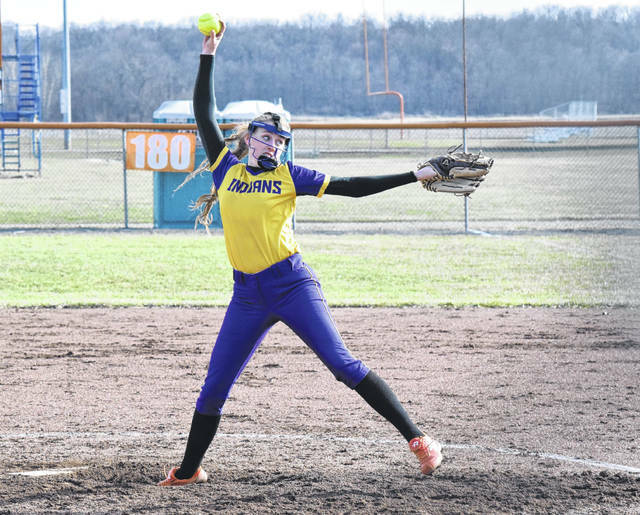 ST. PARIS – Graham defeated Indian Lake, 13-11, in CBC/MRD softball on Monday. For GHS, Lindsay Brayton was 4-for-4 with an RBI, Alyssa Theodor was 2-for-3 with a grand slam and 5 RBI, Lexi King was 2-for-3 with 3 RBI and Olivia Bryant was 1-for-3 with an RBI. Graham (4-1, 1-1 CBC) had six errors in the victory and travels to Indian Lake for a rematch on Wednesday. RICHWOOD – Urbana fell to North Union, 12-0, in five innings of CBC/MRD softball on Monday. For UHS, Emily Skelley was 1-for-2 with a double, Jenny Zaborowski was 1-for-2 and Kacie Martin was 1-for-2. Urbana (0-3) hosts Bellefontaine today. Urbana defeated Northeastern, 5-0, in boys tennis on Monday. In first singles, Ethan Burnside won, 6-0, 6-1. Ethan Headlee prevailed in second singles, 6-3, 6-0. Jacob Coffey won his third singles match, 6-0, 6-0. In first doubles, Riley Johnson and Michael Trudo came out on top, 6-0, 6-1. And in second doubles, Zach Hoskins and Brayden Stouffer cruised to a 6-0, 6-0 victory. https://www.urbanacitizen.com/wp-content/uploads/sites/36/2019/04/web1_FrancysKing040119.jpgMechanicsburg’s Francys King delivers a pitch against West Liberty-Salem on Monday. King shut the Tigers out over five innings, allowing just one hit.